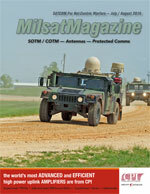 By Simon Davies, Chief Executive Officer, Spectra Group (UK) Ltd.
During my 35 year career as a communications specialist, much of which had been spent in a tactical arena, I began to realize that tactical systems in the military crucially needed new enhancements to provide better and more extensive coverage—these improvements required MILSATCOM to enable viable analysis of rapidly developing scenarios without having to secure land real estate to provide communications as situation evolved. During this time, the nature and tempo of conflict had changed, significantly transforming the information needs of all personnel, from the commander to the front line soldier. Spectra Group (UK) Ltd. was launched with the clear mission to provide reliable and resilient voice and data communications at a tactical level. A number of employees possess a military background and are only too aware of the true value in having such services available—and also realizing what the catastrophic effects could be of failure. SlingShot®, Spectra Group’s best known product, was developed three years ago and as of this writing, around 2,000 units have been sold to key users that have included Special Forces and more than 15 armies, ranging from the Americas to Europe, Africa and the Middle East. The requirement was to deliver the benefits of UHF TacSat at a much more competitive price and without the restrictions that existed on the number of available channels. SlingShot offers this service by attaching a small and lightweight appliqué by coax to the radio’s antenna connection. The appliqué converts the radio frequency to L-band SATCOM frequency for voice and data. 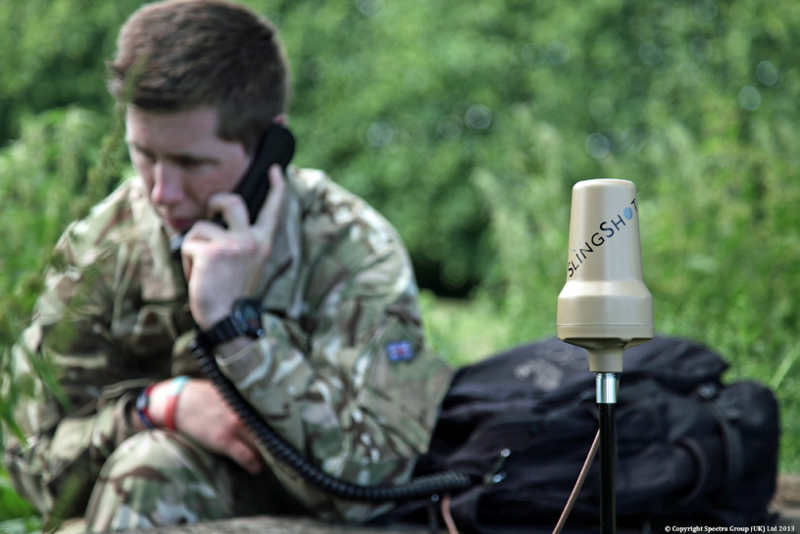 SlingShot is presently being evaluated by the UK MoD to enhance their existing Bowman system and progress the technology to the level necessitated by the new Morpheus Requirement. This small, external adapter for military radios permits low-latency voice and data regional communications, with the additional option of connecting to an out-of-theater rear-base command node. Using Inmarsat’s SATCOM network, SlingShot offers a unique capability to access single-hop L-band relay from an existing global constellation of geostationary satellites. 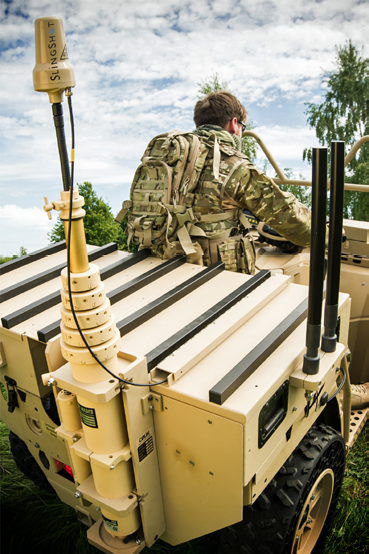 The SlingShot capability can be bolted on to existing tactical radios without compromising the crypto system and delivers a tactical command and control Comms-On-The-Move (COTM) system. Conceived and designed in direct response to military requirements, SlingShot offers clear benefits to those engaged in high-tempo operations, which require reliable and robust COTM. The SlingShot system extends in-service tactical radios to BLOS, COTM devices using commercial satellites. SlingShot uses Inmarsat’s L-TAC™, which provides a flexible service to cater to such high tempo, operational requirements. The nature of the coverage offered by L-TAC allows beams to be booked on a monthly basis with the capability of having large, narrow beams, or more specific multi-headed beams. Such flexibility greatly adds to the ability to move quickly and respond to adapting situations. Inmarsat’s global L-TAC service delivers dedicated bandwidth or, in other words, is not contended. This guarantees quality of service and, combined with the SlingShot system, means that even on the edges of the beam, voice and data communication is not compromised—recent tests proved this at 82 degrees latitude. Already in place by Spectra Group are manpack, vehicle and maritime systems, while the recently introduced aviation capability offers Command and Control Communications of all units, no matter where they are located, to airborne platforms without the necessity for any land or air-based radio re-repeaters. Unlike other BLOS systems, SlingShot delivers robust voice and data COTM and now, with the aviation development, can provide the same capability on fixed wing aircraft and helicopters. Units using SlingShot can maintain secure BLOS PTT COTM. 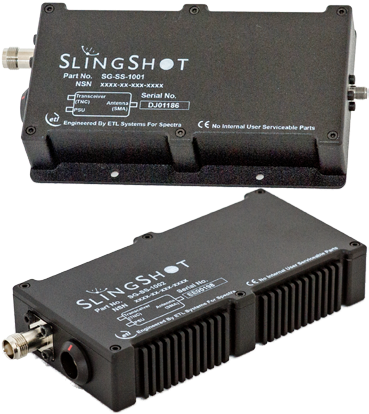 Another beauty of SlingShot is that the appliqué unit, which weighs close to 500 grams, is only a conduit for the radio communications and can be encrypted or unencrypted as required by the user. This allows for full security to be maintained as messages are conveyed between users or bases in locations around the globe. Unlike conventional military manpack satellite communications that require the operator to halt and assemble a bulky antenna and then locate the position of the satellite in the sky, the SlingShot omnidirectional antenna allow instant COTM. (GD) UK tested the system at their Edge facility, where the unit passed with flying colors. Slingshot was also trialed with great success on a recent 3 Royal Marine Commando demo at Plymouth, England, in association with the Defence Science and Technology Laboratory (DSTL). Simon Davies is the CEO of Spectra Group (UK) Ltd. Spectra is a leading provider of Voice and Data services into remote and hostile areas world-wide for Defence, Governmental and Non-Governmental sectors. 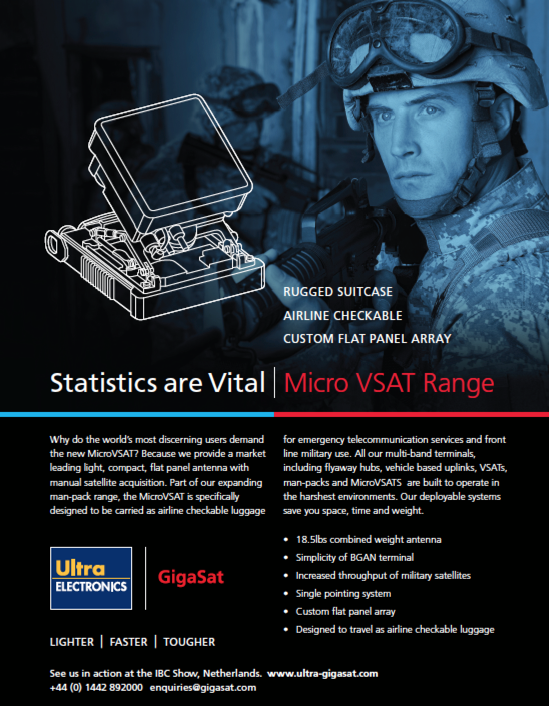 Upon leaving the Military in 2004, Simon established Spectra, which has achieved steady growth over the past 12 years through some difficult economic times and is fast becoming a leading service provider of reliable, robust, reployable communications. Spectra’s services are deployed world-wide in some of the world’s harshest environments and support the UK Military, European Union and Stabilization Unit, to name but a few.